Story……Centuries ago, the evil Emperor Han was cursed by the sorceress Zi Yuan who transformed him and his army into mummies. In 1946, the explorer Rick O’Connell and his wife Evelyn O’Connell are invited by the British government to take a relic, the diamond “The Eye of Shangri-La” to China. The ancient stone is capable of resurrecting the Emperor Han and of pointing the way to Shangri-La and the eternal pool of life. When the couple reaches China, they meet their son Alex O’Connell, who has discovered the tomb of Han, and Evelyn’s brother Jonathan Carnahan. The O’Connells are betrayed by their friend Prof. Roger Wilson, who is associated with General Yang. 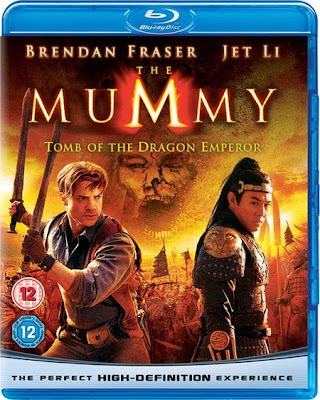 Yang wants to serve Emperor Han, so he resurrects the mummy and they head for Shangri-La. The guardian of Han’s tomb (and Zi’s daughter) Lin tells them that the only ways to destroy Han is to prevent him from reaching Shangri-La or by stabbing his heart with a cursed dagger.